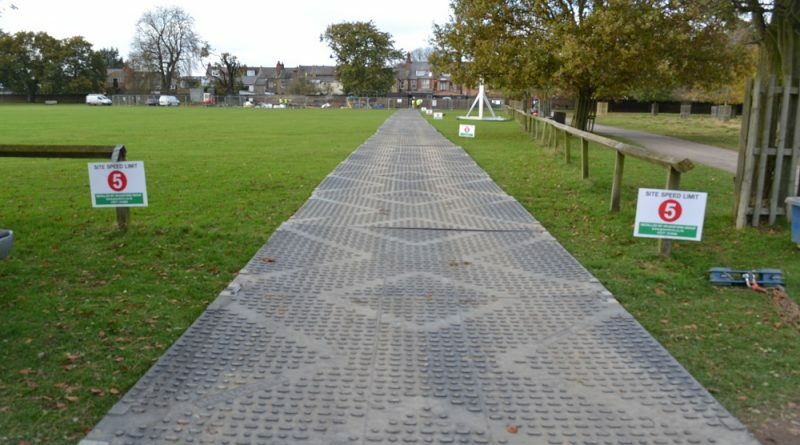 The pavements of the mats used to create access roads and working platforms temporary coatings for moving personnel and heavy equipment in all weather conditions, requiring a stable safe transport, equipment, heavy equipment, and personnel. Mats made of high-density polyethylene using a patented formula of special binders, thereby increasing the strength of the mats, leveled by the thermal expansion, loss of flexibility and elasticity, the negative effects of UV radiation, under the influence of climatic and seasonal changes in features. Specificity of the material is that over time, there is no natural aging and wear of the mat material, the material does not absorb moisture – this property allows in practice mats repeatedly reused at different sites for a long time. An aluminum cam-type system to be applied for fixing the mats is simple and reliable, requires no special tools, fixtures system allows connection of mats in various configurations. Connectors do not corrode and are interchangeable. The connection is made by bolting via the flange laths mats overlapping flush (smooth surface). Special bog mats provide excellent adhesion to the surface, preventing the sliding of the personnel and vehicles (including caterpillar), including the movement of tracked vehicles. Mounting mats by a single turn of the key in each compound. Sealing cover-gasket prevents contamination. Internal ribs have greatly increased the strength of the mats while reducing their weight. Regularly clean figure mats tread lets from the snow and the mud road vehicles in all weather conditions, without creating obstacles for him. Assembling pavement carried out by truck, each mat sequentially inserted into the other, and then fastening the bolt connections are tightened. This fastening scheme (flange overlapping) makes the strongest place of fastening. A small groove between adjacent surfaces of mats for drainage of rainwater, overlapping flanges prevent soil from contamination. The inner layer is reinforced, cross-ribbed structure and distributes the weight load across the mat surface. Installing temporary road surface on the does not require any soil preparation and possible in the swamp, grass, soil, concrete, asphalt, clay and sandy soil. But if it is possible it is best to prepare the ground as follows: fill holes, ditches, smooth surface in high humidity uses waterproof geotextile material. On each mat has a stamp with the serial number, which greatly simplifies the inventory control. Optionally, each mat can be installed GPS sensor to monitor its location. ← What is the difference between giclee and pigment prints?